Thread: Converting bolt on to set? I'm thinking about doing a FB-1 build soon, but I kinda want the neck to be set/glued in. Wondering if anyone else has seen any techniques that could be used for something like this. I was thinking about doing a layer of wood glue between the neck, and using the screws to hold it together till the glue sets. Once the glue has set I'd remove the screws, using a drill I would widen the guide holes by a few mm. And to fill the holes and add support I would use dowels, and wood glue to basically act as the screws. After all that do a bit of sanding over the areas where the dowels were inserted, and filling in of the gaps between the neck and body with a wood glue and saw dust mixture. Any ideas? Or should I leave it a bolt on neck? I would leave it, I don't mind a bolt on. 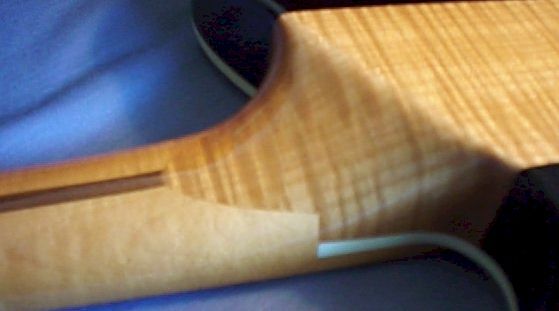 A set neck has a longer tenon so the glue has more surface area to grab on to, so I'm not sure how secure a glued in bolt on neck would be. But, if you really want to glue it, dowel the holes first. Then treat it like a set neck, glue and clamps. Don't drill holes in the neck and make sure the pocket is nice and flat. sorry I misunderstood your question in the other thread. Your plans to convert to a set neck may work but as Pablo says the join may lack strength with a smaller glued surface than a set neck tenon. I don't think anyone on the forum has done this so can't really comment whether it will work. If you do this there's a good chance it will work fine, but there's a bit of doubt in my mind the join may not be strong enough. How would you hide the dowels on the back or will it be solid paint so won't be visible ? Plus if you ever needed to remove the neck I think it would be difficult. I understand the doubt and reckon it's well founded but back around 1970 when smashing gear was part of the act we had a crappy guitar that we busted the neck off at least once a week for a year or so and just glued it back together with PVA the next day. It had been a bolt on and we did exactly what the OP is proposing, the thing is we had no expectation of it lasting forever but it was played for a couple of hours in each show before the destruction started. How did you plan on hiding the dowels in the body, are you painting? Another option (if you are painting) is to countersink the screw holes in the body, then use some sort of plug. At least you know the strength won't be compromised, but the downside is that neck is there for life. Last edited by bargeloobs; 02-07-2015 at 06:25 AM. Have you already purchased the kit? If not, maybe it can be modified at the factory for what you want? TZK this is a dead thread mate.